Check out Tobi's Forever Young Leather Moto Jacket Ready to make a statement? 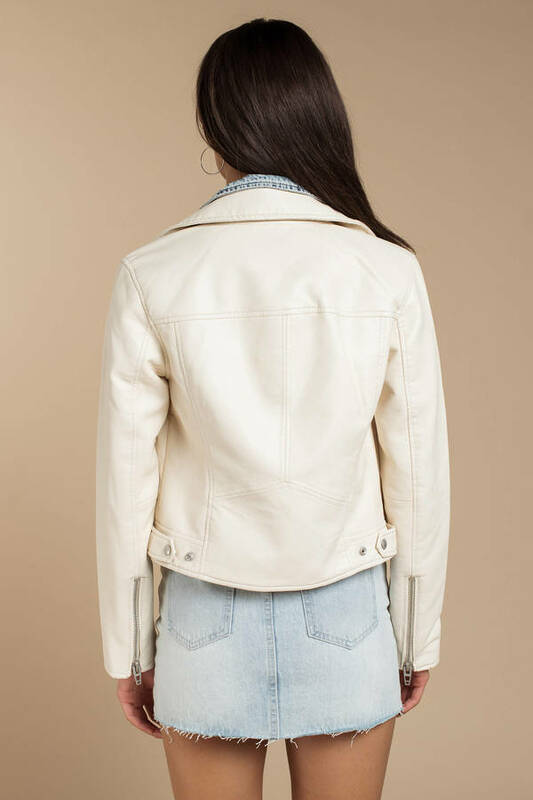 Grab the Blank NYC's Forever Young Beige Faux Leather Moto Jacket next time you step out. This vegan leather jacket features a classic moto cut, side zippers, and a denim underlay that peeks out for a unique spin on a timeless jacket. This denim leather jacket will look so chic with a mini dress and pointed boots at your next happy hour. Ready to make a statement? Grab the Blank NYC's Forever Young Beige Faux Leather Moto Jacket next time you step out. This vegan leather jacket features a classic moto cut, side zippers, and a denim underlay that peeks out for a unique spin on a timeless jacket. This denim leather jacket will look so chic with a mini dress and pointed boots at your next happy hour.